Yesterday, I talked about some methods I use to prevent adult hormonal acne. 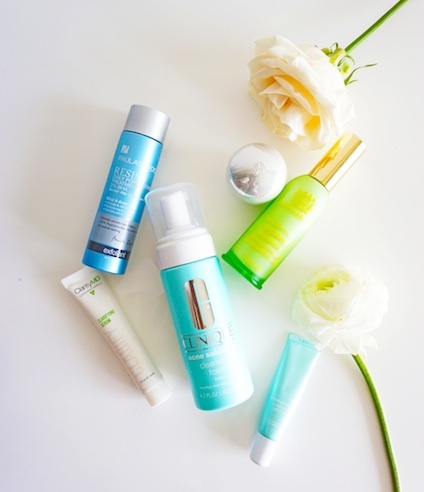 Here, some of my favorite skin care products I use religiously to keep acne at bay. Most experts agree that in order to deal with adult acne, a salicylic acid cleanser combined with a benzoyl peroxide treatment is your best bet. I really like Clinique’s Acne Solutions line — it’s not drying at all (I have super dry cheeks in the winter and neither their Cleansing Foam nor Cleansing Gel has never exacerbated the condition), does not contain alcohol and is fragrance free. The Cleansing Gel contains 2% salicylic acid, while I use the Emergency Gel-Lotion to spot treat pimples with 5% benzoyl peroxide. I’ve never experienced flaking or dryness with these products, so as long as I continue to suffer from hormonal acne, I’ll keep purchasing this line. Between my cleanser and the benzoyl peroxide, I’ll bolster my acne regimen with a salicylic acid toner and salicylic acid serum for my T-zone. Paula’s Choice Resist Daily Pore-Refining Treatment with 2% BHA (beta hydroxy acid is another word for salicylic acid) and the vegan and cruelty-free ClarityMD Clarifying Serum (with 1% salicylic acid) are two products that treat without drying. ClarityMD’s Skin Clarifying Acne Treatment Pads with 2% salicylic acid are a quicker version of the serum (and frankly, less sloppy — the serum’s tube opening and the serum’s lightweight texture sometimes makes it hard to squeeze out just the right amount). I also make sure to mask once a week (I wish I had the discipline to do more) with a clay or charcoal pore-tightening mask, like Estée Lauder’s Clear Difference Clarifying mask. I’ve also incorporated a more “natural” product into my regimen to try to prevent hormonal acne. Propolis, the stuff honeybees use to fortify and sterilize the hive, has long been used as an antibacterial, antiviral, antifungal and antimicrobial agent. LJH Vita Propolis Ampoule contains 50% propolis, and I am hooked on the stuff. It’s so light, unscented and well, light, that you almost feel like it couldn’t possibly be doing anything for your skin. But I could swear that when I use this ampoule long-term, my pores are smaller, my skin looks tighter and my acne is less pronounced. I’ve also now incorporated LJH Probiotics Sleeping Cream, which contains 50% propolis extract, to let the stuff marinate in my skin and do its work overnight. And of course, despite the oiliness of my T-zone, I have to moisturize (after all, oiliness does not equal hydrated). Right now, I’m using the luxe eco line Tata Harper’s Rebuilding Moisturizer, which hydrates with hyaluronic acid (my obsession right now, given my increasingly dry skin) and exfoliates and mattifies oily and combination skin. And on days when I’m feeling particularly vulnerable to breakouts, I apply Shiseido Ibuki Multi Solution Gel as the last step in my skin care regimen. The “bouncy” gel not only addresses a myriad of skin care concerns from enlarged pores to skin barrier function, it soothes and targets pimples. Ever since I read about the acne patches many Korean brands like Missha and Cosrx offer — little clear stickers infused with salicylic acid you put on top of a blemish overnight — I’ve been wanting to try them. Thankfully, Peter Thomas Roth came out with its own version, available at my fave beauty store, Sephora. Now, whenever I have a pimple, I stick one of these salicylic acid infused stickers on top of the blemish and go to bed. It usually takes at least a few nights, but these stickers have definitely decreased the length and severity of my monthly hormonal pimples. Being the relatively lazy person that I am, anything that works overnight as I sleep I’m a huge fan of. If you wake up with a big, red pimple, do not put a hot compress on it. Instead, hold a cold washcloth against the skin to reduce swelling. Visine can also help because it shrinks the blood vessels in the skin; put a few drops on a Q-tip and dab the area. If the event is the next day and you see a big whitehead that you must squeeze, do it gently (and if it doesn’t pop, don’t keep pushing). Hold a tissue against the area until it stops oozing, then put a dab of antibiotic ointment on it and cover with a bandage. When you wake up the next morning, remove the bandage and there should be little or no scabbing. If you let air get to it and it dries out, the scab will be harder to hide with makeup. Apply a medicated concealer containing salicylic acid. Dab on concealer with a fine brush to lightly “stipple” the area — don’t rub. My go-to concealer is Clé de Peau in ochre. It’s pricey, but a stick will last me almost a year. All I know is that I’m actually looking forward to the day when all I have to fight is wrinkles, sagging and hyperpigmentation, and not acne. 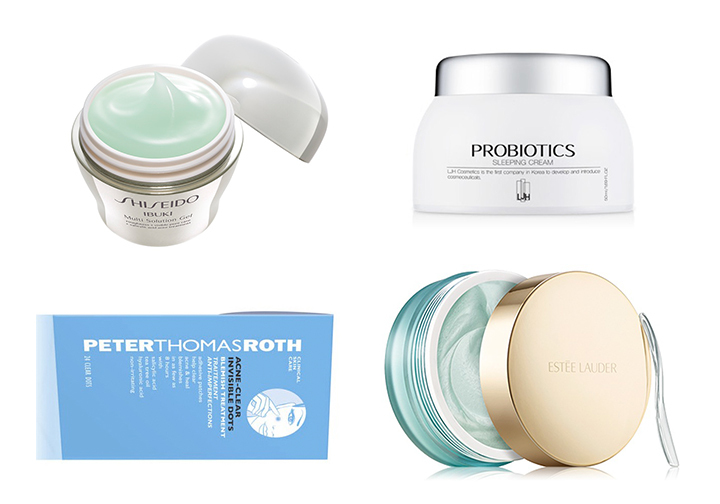 Wanna learn more about what non-skin care steps you can take to minimize breakouts? Read about it here. And I’d love to know what you do to fight hormonal adult acne (one can never have too many tips). Tell me in the comments below!